Within a 100 km of Calgary/Airdrie, Contact me if you are outside my area to discuss travel. I work on a reward basis, that means you pay what its worth to you and what you can afford to have me find your lost ring or valuable. I have a call out fee of $50.00 if the ring or valuable is not found, this covers my fuel expenses. We can discuss this when you call. 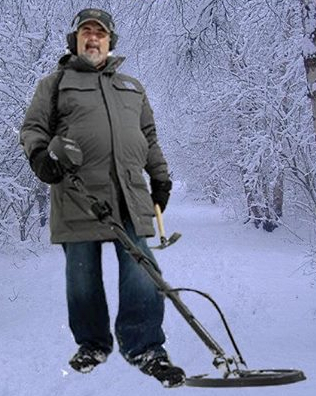 Parks, beaches, yards, fields, snow, survey stakes, almost anywhere, water up to about 3 feet in warm weather . If you lost your Ring, Keys or Valuable in the Snow call me ASAP. I've been treasure hunting ( Metal Detecting) for over 30 years and love this hobby! 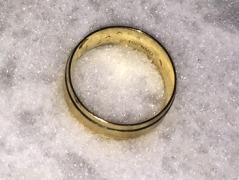 I have found numerous rings and keys and returned them to their owners over the years. I have also been on antiquity hunts and located NWMP buttons which I turned over to a local museum. I joined The Ring Finders to help people find their lost Rings, Keys and Valuables in my hometown and surrounding areas within 100km radius. Outside 100km from Calgary / Airdrie contact me for travel arrangements. Absolutely can’t thank Bill enough! So glad to have the ring back, he was awesome from the minute I called him! If you have lost any jewelry in the Calgary area be sure to call this guy right away! !